Light table time! Transferring the last set of drawings onto strathmore paper. I could kiss you! Heres why: I’m an oil pastel artist and for ages now I’ve been struggling with the dilemma of how to do my roughs because my final compositions are done on dark paper. Until I stumbled across your site and saw you do alot of your rough work on tracing paper! Yay, a simple solution for a small but significant problem. Thank you! Your stuff is also fabulous by the way, your ‘people’ drawings are AWEsome. I’m glad you found something useful in here! 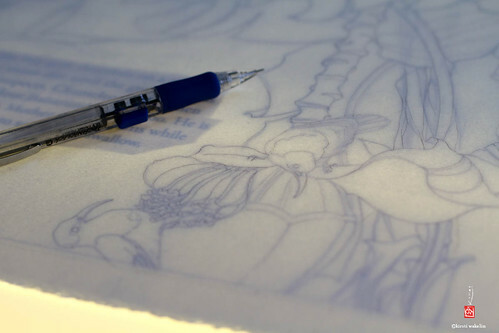 I’d be lost without tracing paper – it would make my process much harder. Sorry to bother again. 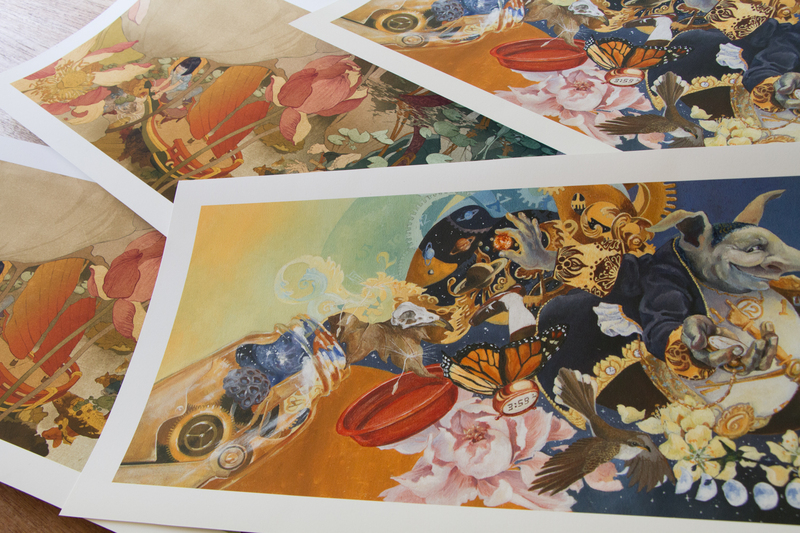 I told a friend about your website and she happens to be a watercolour artist. She’d like to know why you do a large portion of your drawings on tracing paper? No problem, I’ve actually been asked that question a few times. It’s really just part of the process that I find fits well for the way that I work. I use it to work out my compositions and quickly redraw portions of illustrations that aren’t working – I can see through it without the use of a light table (some photos of that here: https://mysecretelephant.com/2010/05/01/new-book-beginnings-db-52/). I also like the smoothness of it – so it makes drawing feel quicker to me. When I get to the final rough stage, and need to transfer my drawings to final paper with the light table, as in the photo above, the translucent tracing paper lets the light shine through much better so I can see my line work easier – less of a light-stopping barrier. This is useful, especially when I’m dealing with a thicker final paper like heavy watercolour paper. Thanks so much, I passed on your response. You drawings are skilled genius and I don’t use that term lightly. My mentor has me working on my pencil sketching and so I’ve been studying hundreds and hundreds of pencil sketches trying to absorb what works and what doesn’t. Your pencil drawings have such vibrancy AND life AND character – they take my breathe away! Really, truly amazing, well done you. Wow, thanks so much for your kind words, Helga. I really appreciate the comment. All the best with your drawing and art study.